At 19,341ft, Mt. 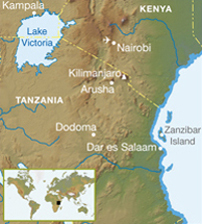 Kilimanjaro is one of the largest volcanoes ever to break through the Earth's crust. Your challenge is to reach its summit. Your trek starts in the rainforests of Lemosho Glades and heads upwards as you acclimatize on Shira Plateau. From here you will catch a glimpse of your goal Kibo, Kilimanjaro's main ice-capped peak. You continue via the beautiful Southern Flank, Barranco Wall and Barafu Route. Our groups have excellent success rates (96%) for trekkers reaching the summit, but don't underestimate the challenge ahead. Most trekkers will never have experienced a day as tough as this, with 3,281ft of ascent and over 6,561ft of descent. It is however victory day!